You can browse the Hobby Lobby Ad here. It’s a very simple kind of ad that shows only the discounts on categories. For example, you can have a 50% discount on frames like open frames, photo frames, shadow boxes, on the weekly ads. Crafting and home decor products are the main things to find a Hobby Lobby store, however, there are a lot of departments such as art supplies, seasonal items, floral, fabrics etc. We can combine all these into two main headers for sure. 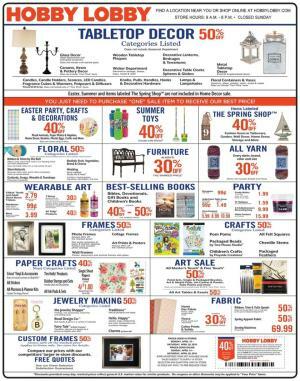 Hobby Lobby Weekly Ad is an important tool to get these products at lower prices. You will beware of the new prices of popular items and special deals. The store is also providing services like DIY project ideas and videos. Moreover, the coupons significantly lower the prices or the cost of overall shopping of yours at Hobby Lobby Stores. For instance, you may use an online coupon to get a 40% discount on all the regular prices. You can apply the coupon on your card in the shopping site of the retailer. Hobby Lobby is an arts and crafts store providing all these products with nice discounts all the time. It operates with 822 stores nationwide in the United States. 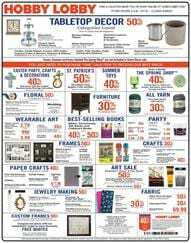 You can subscribe to the weekly ads to get emails about the deals from this retailer. You can find Home decor fabric and other fabric types. Buy candy wafers, balloons, white fondant, and more at Hobby Lobby stores. Follow our Facebook page where you can find these in your feed. Also, subscribe to the newsletter to get emails. Don't miss out the next Hobby Lobby ad tomorrow.